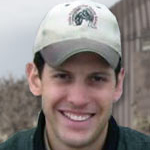 In 2013 Mark Walton, a rancher near Oral, South Dakota, who has had his share of good working cow horses, bought Rio, a 7 year old Dunn horse with a quarter crack on the right hind foot. At that time, Rio did not seem to be bothered by the crack. Follow the story of Rio's quarter crack as it is stabilized, properly shoed, and maintained to keep Rio sound and able to perform his job as a working cow horse. This quarter crack developed when Rio was a weanling, and fortunately the previous owner had always kept the foot shod to protect the crack. The crack extended into the hairline which affects the growth of the foot. 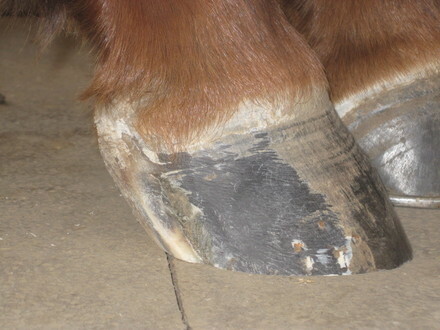 This particular type of quarter crack, which extends into the hairline, affects the growth of the foot and always has to be maintained because the hoof growth has been disrupted. 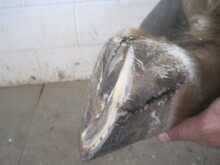 Some horses can get by, depending on the severity of the crack, with minimal farrier work. Other cracks are worse, and require more attention. 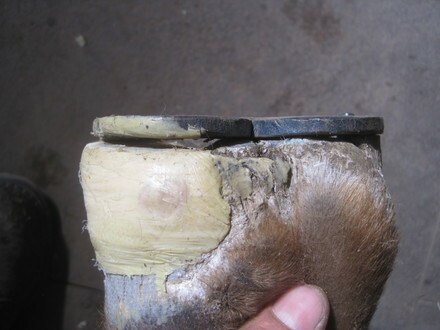 A regular shoeing schedule is essential to prevent the foot from getting too long, since when the foot is left too long, the quarter area is weakened and then the crack worsens. After working Rio hard at a branding, the crack began to get worse, and Mark began to look for some help from a knowledgeable farrier. The crack extends into the hairline which affects the growth of the foot. Mark went to Dr. Sheila Lindsey, a veterinarian from Fall River Vet Clinic near Hot Springs, South Dakota, to come up with an alternative for treating Rio’s crack. 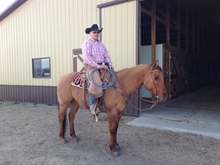 She referred Mark to Butler Professional Farrier School, LLC, near Chadron, Nebraska. Mark called last September and set up an appointment. He then drove an hour and half to Butler’s Farrier School located in northwestern Nebraska. 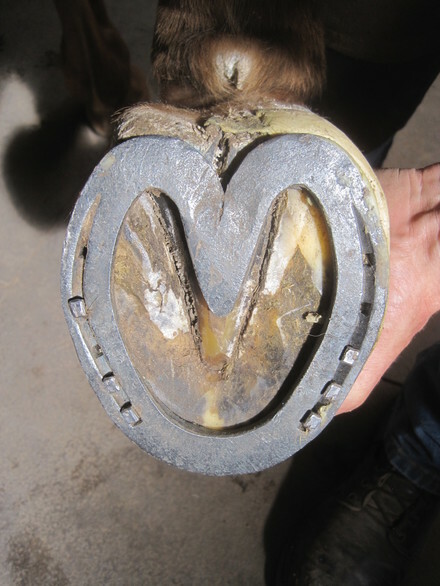 As the condition of the hoof was assessed after looking at the crack on the outside of the right hind foot, a heart bar shoe was nailed on the foot to transfer the weight off of the outside quarter, where the crack was, to the frog. A heart bar shoe was nailed on the foot to transfer the weight off of the outside quarter, where the crack was, to the frog. A heart bar shoe can be used for any number of reasons but it is valuable in treating a crack to take pressure from the crack area and transfer it to the frog. 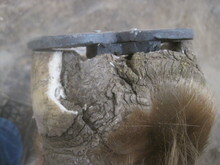 Generally the nail holes would be located in the front half of the horseshoe not to interfere with the crack in the quarter. A handmade shoe is helpful since you can customize the nail holes location. 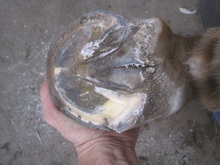 The heel and quarter on the outside of the hoof were trimmed lower so they wouldn't’t touch the shoe. This is called floating the heel. Each crack is individual and may require different methods of treatment to accomplish the principle of relieving stress from a specific area. The crack can become irritating as a horse moves due to the friction between both sides making the horse uncomfortable and lame. The crack must be stabilized as part of the treatment. This can be accomplished with a urethane polymer or composite patch which is a two part material which hardens as the two are mixed together within a short time limit. As this is placed on either side of and over the crack it stabilizes the crack, allowing it to prevent irritation and movement. 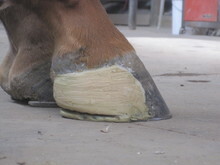 As the hoof grows before the next shoeing interval you will see some new growth right beneath the hairline. Fiberglass can also be mixed in to the patch to give extra strength. It’s really important not to cover a crack if it is moist or there is any drainage coming out of it, to prevent infection. Several appointments were necessary to repair the crack, stabilize it, and make sure it could be maintained. Committed horse owners are part of the formula to ensure success when dealing with cracked hoofs. In this quarter crack progression you can see the new growth of the hoof as it has begun to grow out. Rio is more comfortable now and able to be used for ranch work. This was the first shoeing that we worked on Rio. 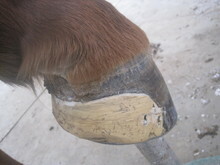 He had recently been shod, so there wasn’t a lot to trim off the first time he was done. We replaced the shoe with a heart bar shoe and stabilized the crack with an Equilox Fiberglass patch. Notice how the outside is lower than the inside heel and there is a space between quarter and shoe. 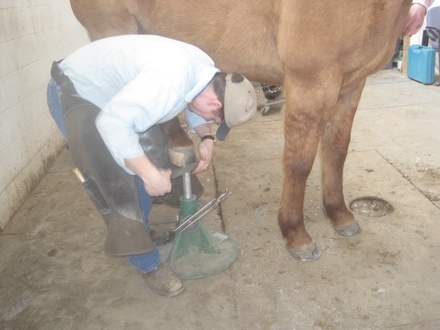 During the second shoeing appointment, everything was done exactly the same as during the first appointment. The heart bar shoe was reset and the patch was cleaned up on the edges where it was loose. Note the new growth below the hairline in the photo. Evaluating hoof again after the patch is removed. When Rio is brought in for his third appointment, the patch is again removed and the crack, evaluated. There is new growth and the foot looks healthier. The heart bar shoe is reset and then the patch is replaced. Replacing the patch before nailing the shoe on the foot makes it easier. Also, it is easier to float the heel before nailing on the shoe. Every quarter crack is different and some need a high level of maintenance. We cleaned up the patch and replaced the heart bar shoe with a plastic shim to maintain support by the frog. The heart bar was worn down in the toe and the foot shape had changed making it necessary to replace the shoe. Each horse and hoof crack is individual due to its depth and location. 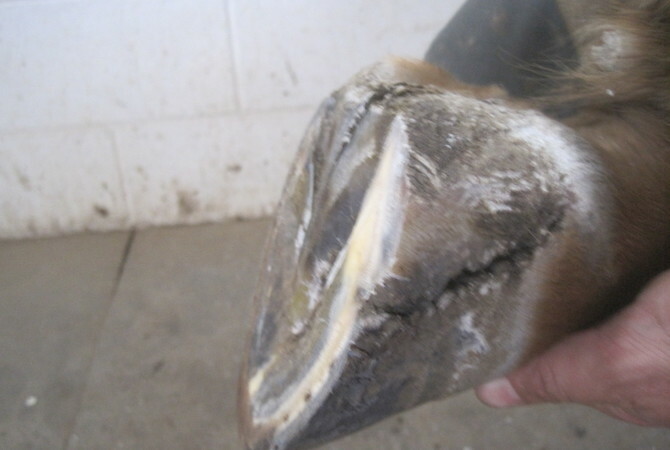 This type of situation requires a higher level of maintenance since the horse needs to be shod on a regular basis to keep him going. To prevent additional injury which could cause further cracking, we recommend that the owner apply Vaseline or Bag balm to the coronary band. Some feet will worsen from an injury that is not maintained. This allows the weight to be taken off the sore area and temporarily transferred to frog. This particular crack will continue to need further maintenance as it grows down. This is a horse that will always have to be shod because of the nature of this crack since the coronet injury which has affected the hoof growth is permanent. Each time the horse comes in for an appointment, the patch will be removed and the crack evaluated. Success can be measured in this example when the horse is sound and able to perform even though the horse has an injured foot that must be maintained. To reach the frog a shim of plastic or leather can be riveted to shoe. Note the gap between the heel and shoe, this is called floating the heel. This allows the weight to be taken off of the sore area and temporarily transferred to the frog. The frog forms a "V" into the center of the sole and is a spongy, flexible pad and weight-bearing surface between the plantar cushion and the ground. The frog is a good indicator of the health of the foot. A healthy frog has sufficient flexibility, expansion and ground contact to facilitate the circulation of blood and the absorption of shock throughout the foot.